Dependable access to running water in your home is a modern convenience that most of us cannot imagine living without. Don’t let those reliable faucets take all the credit, though. Your Sacramento drain and sewer system need to be just as dependable in order to dispose of all that used waste water in an effective, hygienic way. 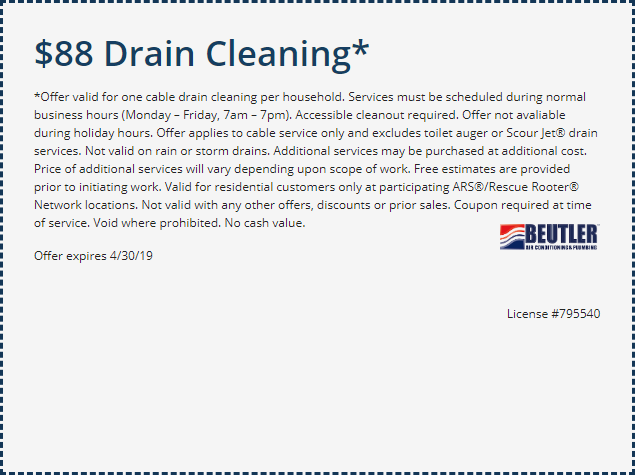 When you need drain and sewer installation, maintenance and repair service in Sacramento, call the professionals at Beutler Air Conditioning & Plumbing. We’ll make sure that waste water is taken out of your home with the efficiency you need. When a drain in your home is clogged, don’t be tempted to reach for harsh chemical cleaners. While they may break up a clog enough to get some water through they will likely not remove the entire blockage. Leaving part of the clog in your drain means that it will be able to build up more quickly the next time, and there will definitely be a next time. In order to properly clean a drain, you must be sure that you have completely cleared any clogs. Of course, the fact that you cannot see into your drain makes that a challenge. Fortunately, the professional plumbers at Beutler Plumbing have the necessary equipment to ensure that your clog is totally resolved and that your pipes are moving water as efficiently and obstacle-free as possible. Request an appointment today!